Morihei Ueshiba (pronounced Moh-lee -hay Oo-way-she-bah) was the creator of Aikido. To his followers today, Ueshiba is known as O'Sensei, which means "Great Teacher". O'Sensei was born in 1883 and died in 1969, so Aikido is one of the modern martial arts. Master Ueshiba began his studies of the martial arts shortly before 1900. He studied a number of styles of jujitsu, spear work and sword work, and was deeply influenced by the Shinto religion and the Omoto Kyo sect. In 1911 he encountered Sokaku Takeda, a master of Daito ryu Aiki-Jujitsu, and studied this form of grappling art with him for five years. 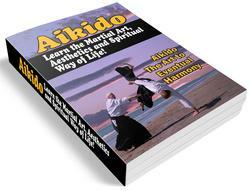 The word "Aiki" refers to the technical strategy upon which the defense maneuvers of Aikido are based. This strategy is one way of incorporating the principle of accord into defense movements, and it is usually talked about in English as "blending." 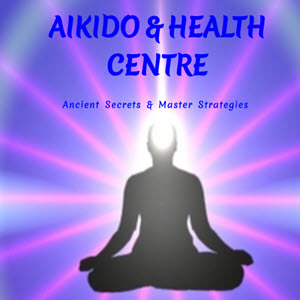 In aiki, the warrior merges himself with the attack in a fluid, circular way. In merging or blending with an attack, there is no holding back, separateness. The attack comes in, the defender accepts it the way a whirlwind accepts anything that comes close, and then the defender releases his hold and throws the attack away. Aiki-jujitsu formed the basis of O'Sensei's art of Aikido. He added techniques and movement principles that he had learned from his other practices and worked at refining his art. However, as he developed his art, O'Sensei began to feel that there was something lacking in his understanding of budo ("bu" + "martial," "do" = "path,"
"Budo" = "martial art"). He began to feel that everything he had learned was useful only for destruction. After much inner searching, Ueshiba had an experience which revealed to him what he had been searching for. This was in 1925, and this experience formed the basis of O'sensei's understanding of aiki and his way of using it in his art. Rather than seeing Aikido as no more than a way of joining movements together to result in a harmonious flow of motion, O'Sensei saw Aikido as a universal principle of love, and the practice in the fighting strategy of Aikido became a tool for discovering the universal principle of aiki. This can be seen in O'sensei's description of Aikido in "Memoir of the Master", in the next section of this beginner's guide. The name "Aikido" is composed of three Japanese characters. "Ai" means "harmony" or "love." "Ki" means "energy" or "spirit." And "Do" means "path." Taken together, the characters which form the name of the art mean "The path to harmonious energy" or "The path to a loving spirit." The art of Aikido as it was taught by Master Ueshiba and is being taught by his successors focuses on training the spirit through study of the physical fighting techniques. As O'sensei grew older, the techniques he practiced continued to grow smoother and rounder. He modified the basic aikijujitsu techniques so that practice could be carried on with full force and yet have minimal risk of injury. However, since the techniques still remain very close to the original aikijujitsu techniques, it is easy to see how any given technique could be used so as to inflict severe injury or death to an attacker. As a result, the psychological impact of the life and death situation is preserved in Aikido and operates in its training of the spirit, and Aikido also continues to function as an effective self-defense method. How do the techniques function as a means of changing aggressive attitudes? The key lies in the fact that it is attitude/intention which creates movement. The Aikido techniques are smooth, circular and gentle (in a powerful way), and no one can perform harmonious movements if he is filled with fear or anger. These feelings automatically lead to intention to perform the type of movements called for by fear and anger — rigid, unbalanced, jerky movements of resistance and aggression. By examining his/her movement qualities during the execution of a defense technique, the Aikidoist can detect flaws in his/her attitude. And by working to correct his moves, the Aikidoist can correct her/his attitudes.